We've just released two new weapon skins, the Colossus Axe and the Colossus Machete! Check them out below or click here to get yours. The Colossus Machete works with one or two-handed sword, one-handed axe or one-handed mace, replacing their standard appearance with a sharp metallic machete. Watch its video below! The Colossus Axe only works with staves, two handed maces or axes, but looks different on each type of these weapons. Check it out below! Both of these skins will look great with a combination of the Pitch Black Armour Set and the Black Hooded Cloak. 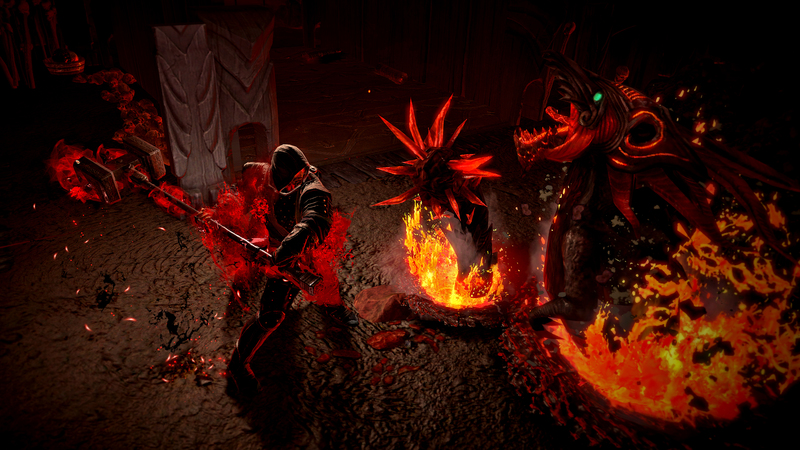 To get a more fearsome look, add the Fiery Eyes, the Gore Character Effect and imbue your new weapon with the Ultimate Chaos Weapon Effect. Idk if I like the three in one MTX tbh. If I get an axe MTX and it can go on a staff I would expect an axe. EDIT: Totally adding that Machete to my collection the moment I make a character that can use it.